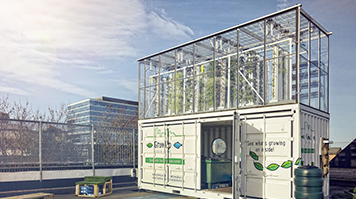 The GrowUp Box is a community urban farm in Stratford, London, producing sustainable fish, salads and herbs from an up-cycled shipping container. The project engages, educates and inspires communities about sustainable food production and helps people make informed decisions about the food they buy and eat. As a business, GrowUp Community Farms is looking to build similar projects in other communities across London. This new enterprise is a spin-off from GrowUp Urban Farms, which started four years ago. GrowUp Urban Farms is committed to feeding people in cities in a way that is positive for communities and the environment, today and in the future. They produce sustainable fresh fish, salads and herbs in cities using a combination of aquaponic and vertical growing technologies. This lowers the environmental impact of agriculture by building and operating farms that use unused urban space to grow produce. Through the use of aquaponic technology and protected cropping, a year-round harvest of fresh, leafy vegetables and fish is produced and delivered to consumers in London. It’s fantastic to see all the university’s hard work recognised by being named Entrepreneurial University of the Year, and there is no doubt that without the staff at LSBU supporting my passion for urban agriculture I simply would not have been able to test and develop so many of my ideas. “I had worked in architects’ offices within the UK and India and always been interested in the symbiotic relationship between nature and society. As a result, I started working with two colleagues on the GrowUp Box in 2013,” says LSBU graduate Sam Cox. Sam says he was motivated to become involved because within his studies at university he had always been fascinated by the positive social impacts of growing food in cities and so leapt at the opportunity to design the GrowUp Box to further explore this. From the success of the project he co-founded GrowUp Community Farms to deliver further aquaponics systems and accompanying educational programmes. To find out more about GrowUp Community Farms, visit: www.growup.community or get in touch with the student enterprise team.